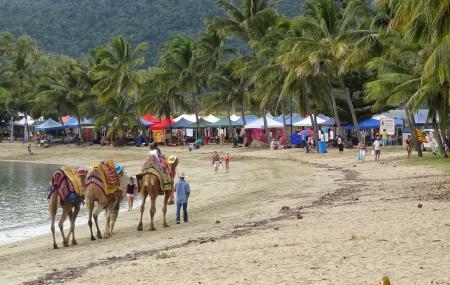 Find hotel near Airlie Beach Community Ma ..
Set up every Saturday on the Airlie Beach foreshore the market offers a range of goods on sale. One can buy local arts and crafts, fruits and vegetables, locally made clothing, souvenirs and lots more. The market showcases artworks of several local artists and crafts and jewellery from local artisans, which are definitely worth a look. There are also some food stalls and rides for kids. The open-air market is buzzing with activity from early morning till about noon and is famous among locals and tourists alike. Love this? Explore the entire list of places to visit in Airlie Beach before you plan your trip. Fancy a good night's sleep after a tiring day? Check out where to stay in Airlie Beach and book an accommodation of your choice. How popular is Airlie Beach Community Market? People normally club together Bicentennial Walkway and Airlie Beach Lagoon while planning their visit to Airlie Beach Community Market.